Feeling: Standing in the cover of silvery landscape. In my sight, aurora wrinkles. Cold makes it more mysterious... Feel like so. 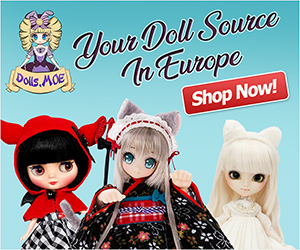 Pullip Chill is a stunning young teenager who stands approximately 12 inches tall. The first thing you notice about her is her alluring dark brown eyes. Her eyes will close, move side to side and if she really likes you she’ll grace you with a wink. The other feature that really catches your eye is her long sleek black hair that falls mid-calf. Her hair contrasts her fair skin beautifully. Her long black winter jacket is finely detailed and falls to her knees. Black and white trim runs down the left and right sides of her jacket, while also circling each sleeve at the cuff. Both cuffs of her jacket are trimmed with white fur, which also trims the bottom of her jacket. The jacket is held closed by a fine black cord which criss-crosses from left to right starting at her collar down to the bottom of the jacket. Another fine cord travels the bottom of her jacket, just above the white fur trim that can be tied closed. She wears cute black leggings under her jacket to help protect her from the cold. On her feet are adorable black boots that are trimmed with white fur to match her jacket. If the cold is particularly fierce then she has a black hood to wear. The opening of the hood is trimmed with black fur for additional protection from the blistering cold. This doll is fully articulated and comes with a number of accessories. Some of the accessories included would be a doll stand so you can display her proudly, a polar bear pelt for her to snuggle up with on those exceptionally cold nights, her own trading card and her bio which includes all her likes, dislikes and interests. She is a delight to look at and will make an excellent edition to any doll collection.